GREELEY — Colorado’s oil and gas sector contributed $31.38 billion into the state’s economy in 2015, with 232,900 jobs, according to a 2017 study by PricewaterhouseCoopers. And part of that annual economic impact is felt by donations to charitable organizations, projected at $5.2 million in 2017. • ExxonMobil donated almost $1 million to higher-education institutions in Colorado and $50 million nationwide. • Noble Energy partnered with the Rocky Mountain Raptor Program to protect birds in areas in which the company operates. • PDC Energy matched donations at KFKA radio’s program benefiting United Way of Weld County. Employees also packaged 20,000 pounds of food for the Food Bank of the Rockies. • Extraction Oil & Gas announced that it would alter its drilling schedule near a Greeley school. • Anadarko partnered with the Red Cross Mile High Chapter to install 100 free smoke alarms in at-risk communities. Tschillard of the Poudre Learning Center discussed the PLC Energy Institute, which works to inform teachers about energy derived from oil and gas and have them develop lessons that they can implement in their classrooms. The Poudre Learning Center is located at 83rd Avenue and West F Street in Greeley. Bob O’Connor, CEO of the Weld Food Bank, said the energy sector has donated 10.9 million meals to the Weld Food Bank in the past five years, totaling about $2.1 million in value, along with more than 10,000 volunteer hours from the energy sector. He said energy companies have donated for a new building for the Weld Food Bank, a new truck and new ovens, and was instrumental in providing relief for the 2013 floods. Susan Fakharzedah, senior manager, community relations, PDC Energy Inc., said a standard donation of $5,000 turned into $12,000 raised for the Food Bank of Weld County to help purchase turkeys over the holiday season, with PDC matching contributions up to $5,000. “We took a standard contribution and by pulling together a web of people, we made it a lot bigger,” Fakharzedah said. An “Economic Impact” panel provided insights about the scope of the sector in Northern Colorado. The panel was moderated by Kathleen Sgamma, president of the Western Energy Alliance. Kathleen Staks, executive director of the Colorado Energy Office, said that renewable sources of energy have increased in terms of their share of the overall Colorado energy portfolio, with coal dropping from 44 percent to 26 percent in the coming years. That’s partly because of state mandates for renewable energy, but also because of plans by Xcel Energy to retire coal plants and launch natural-gas plants, even as the utility brings on more wind and solar projects. She said that renewable-energy projects bring jobs across the state for manufacturing and construction, with the state employing 57,591 clean-energy workers in 2017. “Clean-tech jobs are on the rise, and they are spread across all 64 counties,” she said. Tom Parko, director of planning services for Weld County, said conflicts are increasing between energy companies and residents, especially those who move into the county from outside the area. He said the county works hard to inform new residents about both the energy and agricultural sectors to avoid problems. 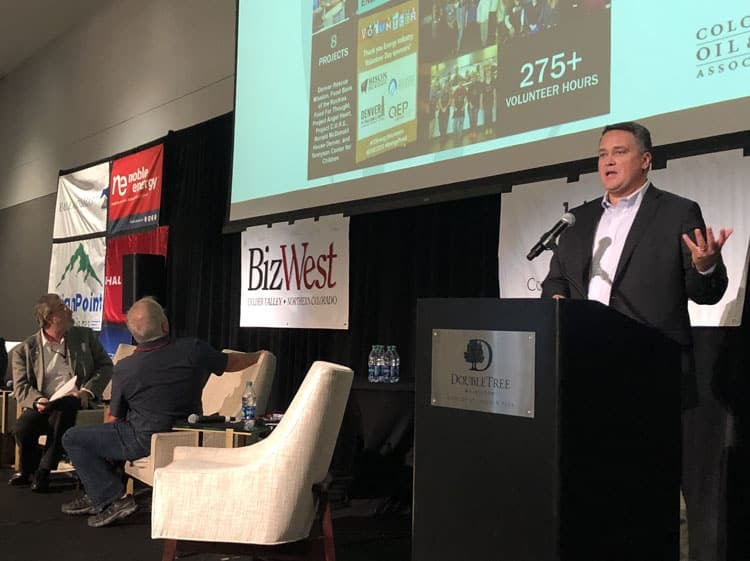 He said that the mining sector — which includes oil and gas — accounts for about 10 percent of the Weld County economy, while ag accounts for 21 percent. He said 60 percent of Weld County’s property-tax revenue is derived from the energy industry. “Since 2012, mining alone accounted for 12 percent of the total job growth on average per year,” he said, with oil and gas accounting for 7 percent of the job growth. “It’s huge in terms of what kind of impacts it means for Weld County,” Parko said.